Back in the day, this was J. Fred Johnson’s headquarters. When I did this, Arcata was there. It houses city offices now. 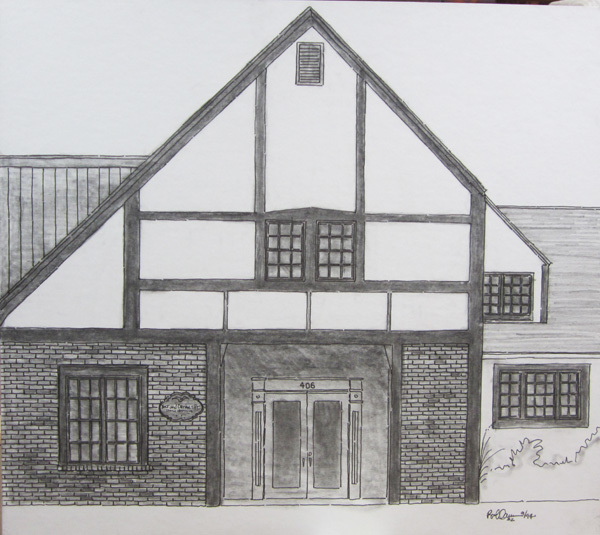 This entry was posted in Bob Lawrence Art and tagged Home Improvement building, J. Fred Johnson, Kingsport TN on January 24, 2013 by Bob Lawrence. When I got out of the Air Force and back from Germany in 1967, this was the only place in Kingsport that had pants close to the bell bottoms I saw all over the place in Europe. The pants I bought here looked like mattress ticking and didn’t have back pockets, but, hey, I was forward fashion! This entry was posted in Bob Lawrence Art and tagged Charles store, Kingsport TN on January 24, 2013 by Bob Lawrence. The old Public Safety Building, corner of East Center and East Sevier. Earlier, it was Douglass School, built in 1928. All gone now. 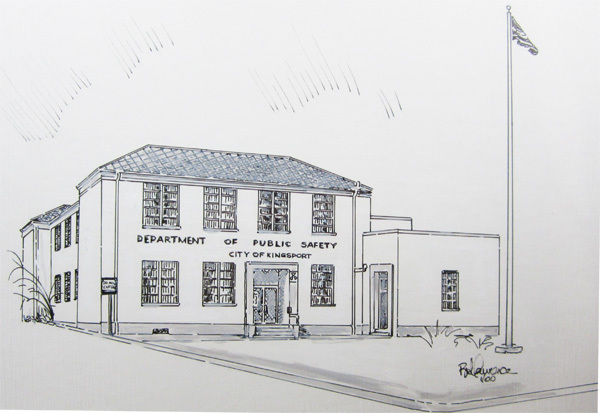 This entry was posted in Bob Lawrence Art and tagged Douglass School, Kingsport Department of Public Safety on January 19, 2013 by Bob Lawrence. 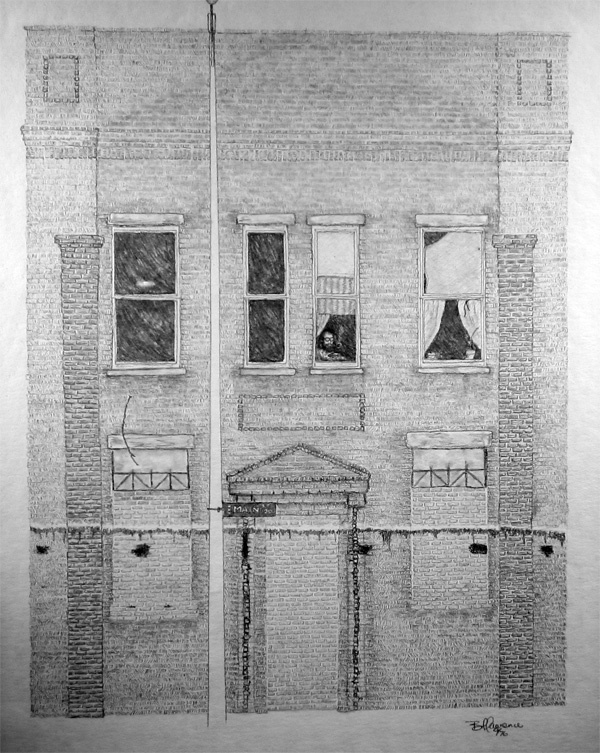 The is the same building as in the previous entry, just 20 or so years earlier. 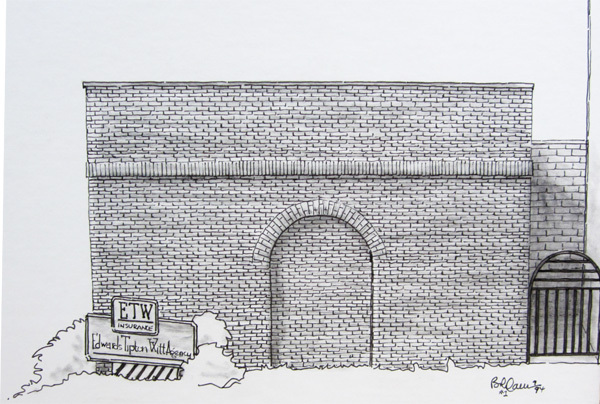 The line across the building is where the roof of the watch repair shop joined the brick of the main building. Upstairs were apartments. That’s me, back when I smoked a pipe, sitting in the window (artistic license: I didn’t live there). 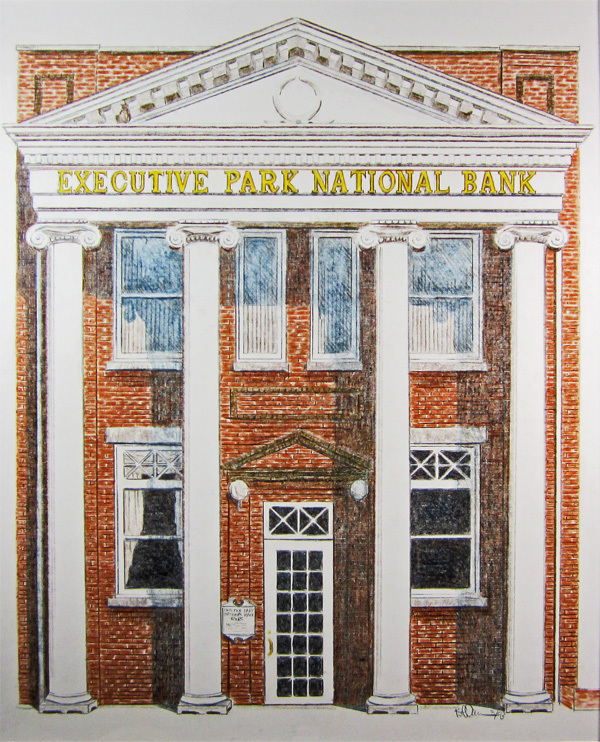 This entry was posted in Bob Lawrence Art and tagged Kingsport TN, old bank building on January 19, 2013 by Bob Lawrence. This, of course, is on the corner of Main and Broad Streets. It was a bank off and on for decades. Back in the 70s, there was a watch repair shop across the front of this building (the portico and columns were gone at that time). 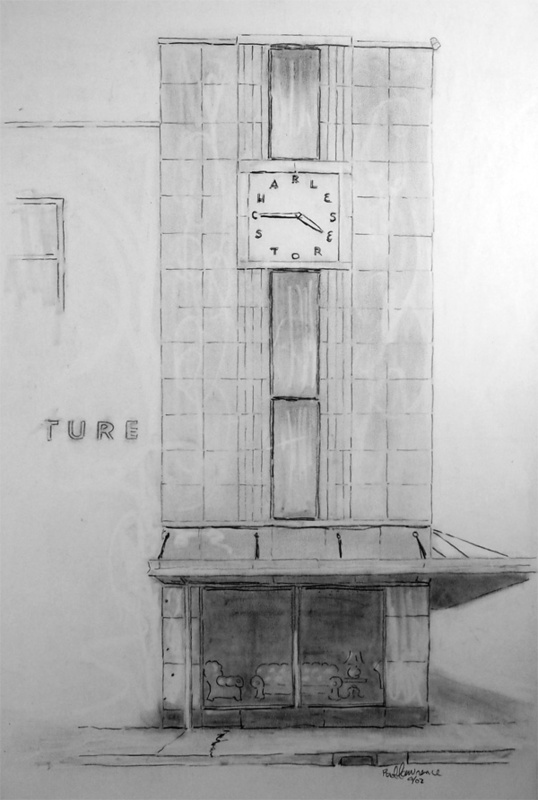 An earlier pencil drawing I did of this location shows the marks of where the roof of the watch shop was. 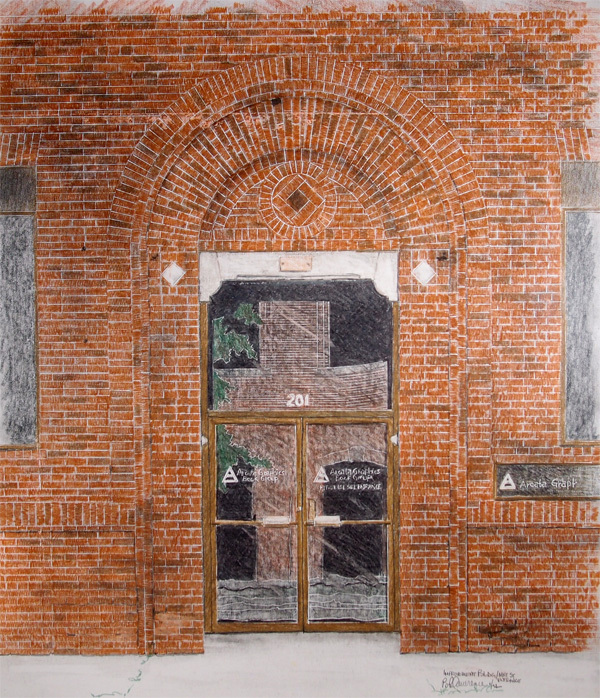 This entry was posted in Bob Lawrence Art and tagged bank, broad street, Kingsport TN, main street on January 11, 2013 by Bob Lawrence.